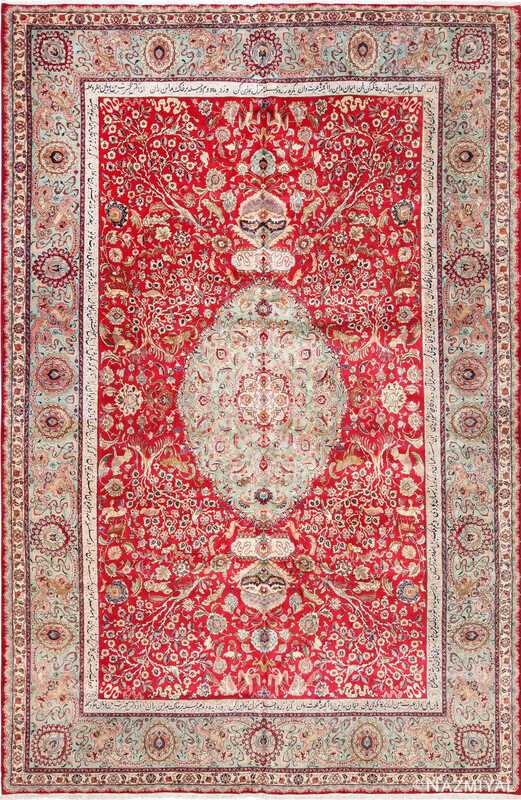 Magnificent and Extremely Fine Large Size Geometric Vintage Silk and Wool Persian Tabriz Rug, Country of Origin / Rug Type: Vintage Persian Rug, Circa Date: Late 20th Century – This breathtaking silk and wool vintage Persian Tabriz rug displays a level of artistic skill and genius that is rarely matched. 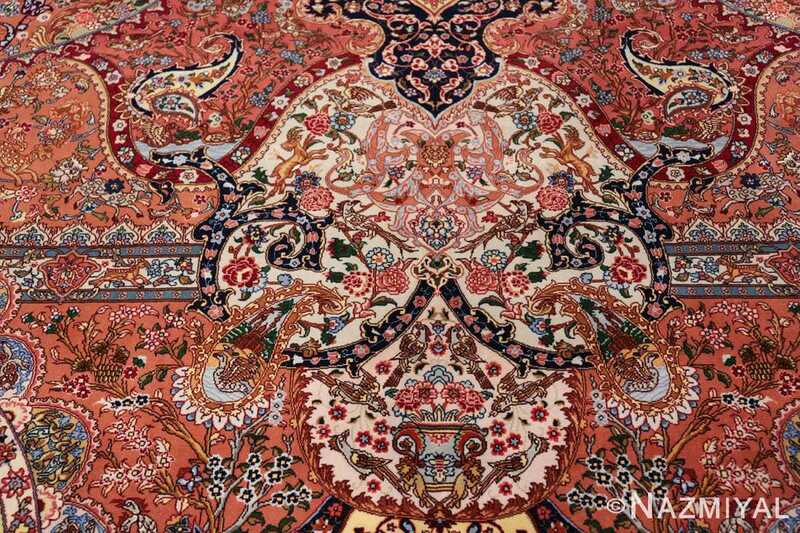 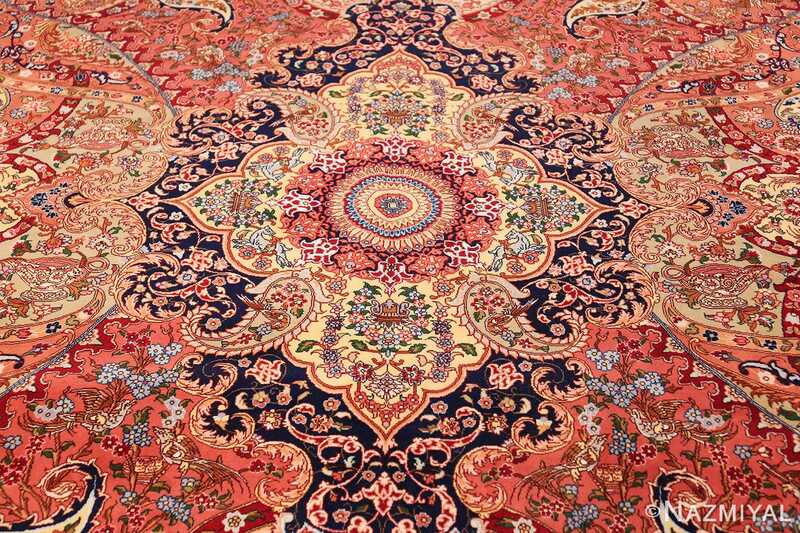 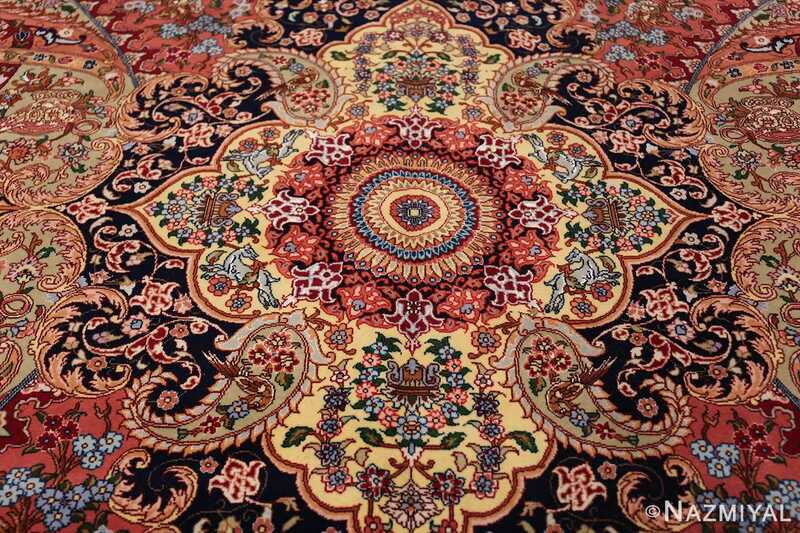 The intricate patterns and color schemes that we see in the impressive vintage Persian rug are beautifully manipulated to produce a three dimensional visual effect. A myriad of colors and hues are used, but the most prominent are rustic coral, yellow gold, and luminous sea foam teal. 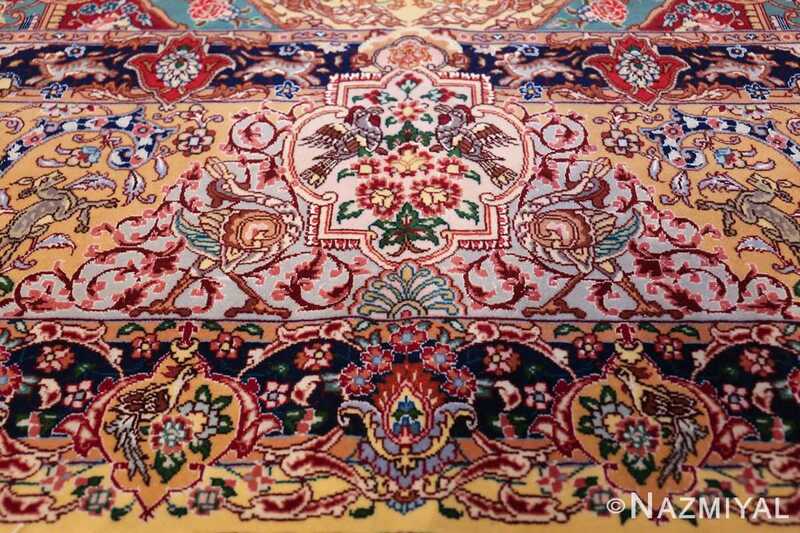 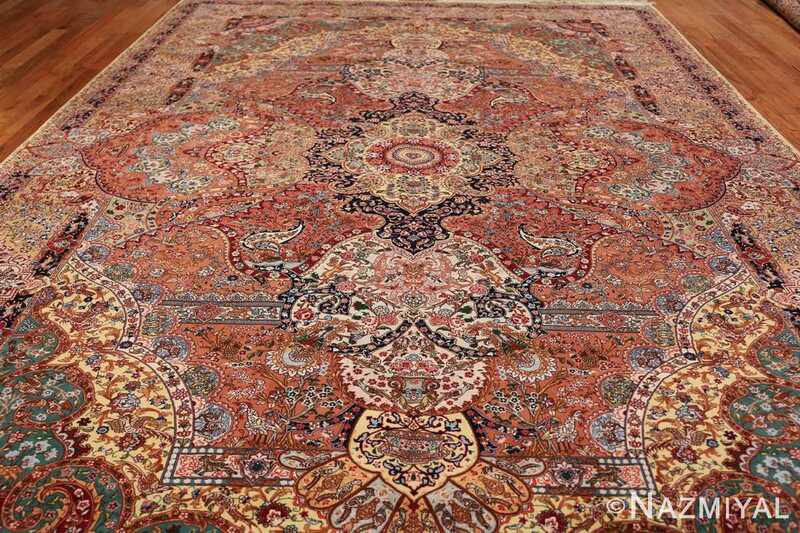 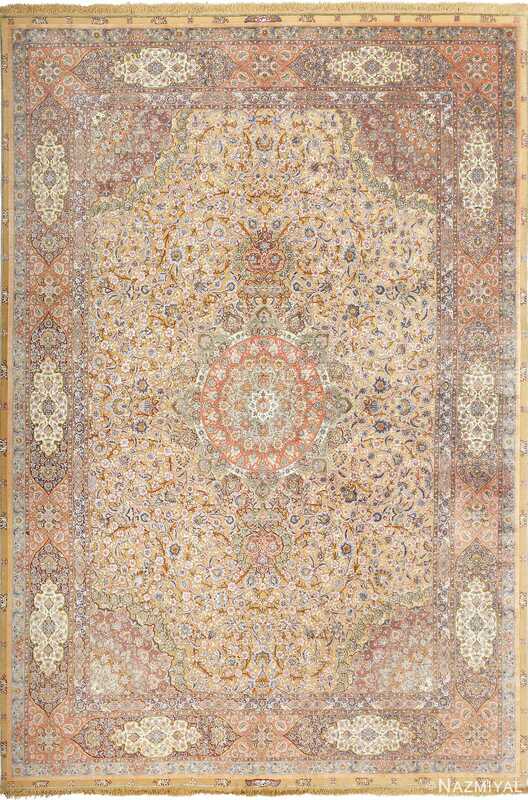 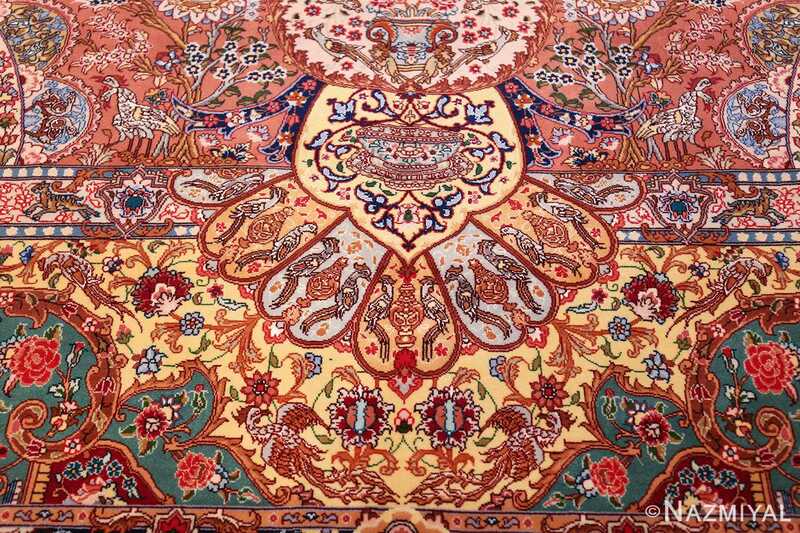 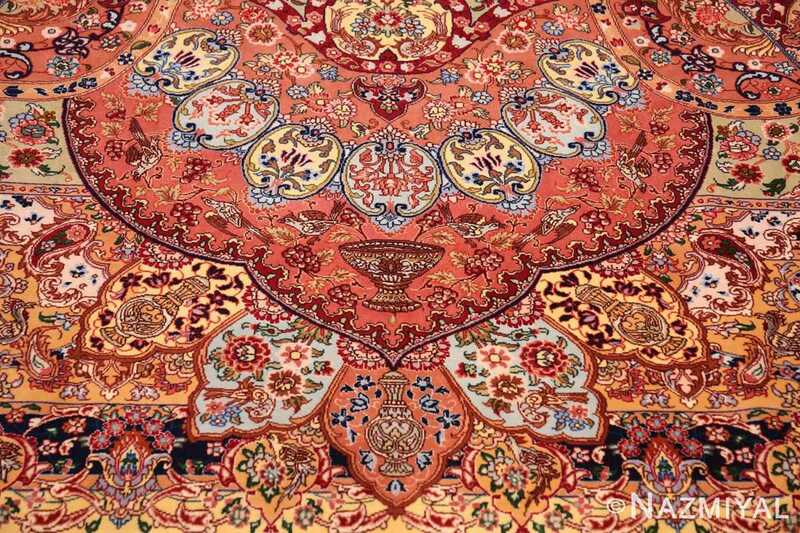 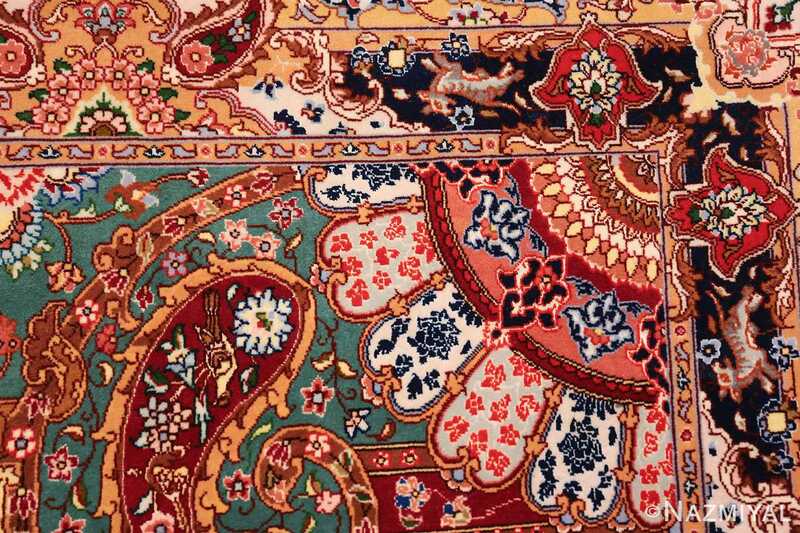 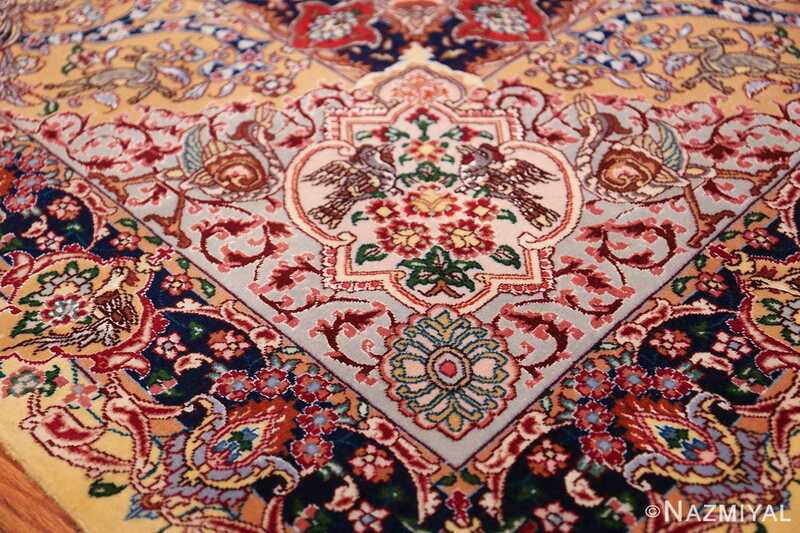 The design of this magnificent silk and wool rug is a blooming display of soft geometric shapes and fancy ornamentation. 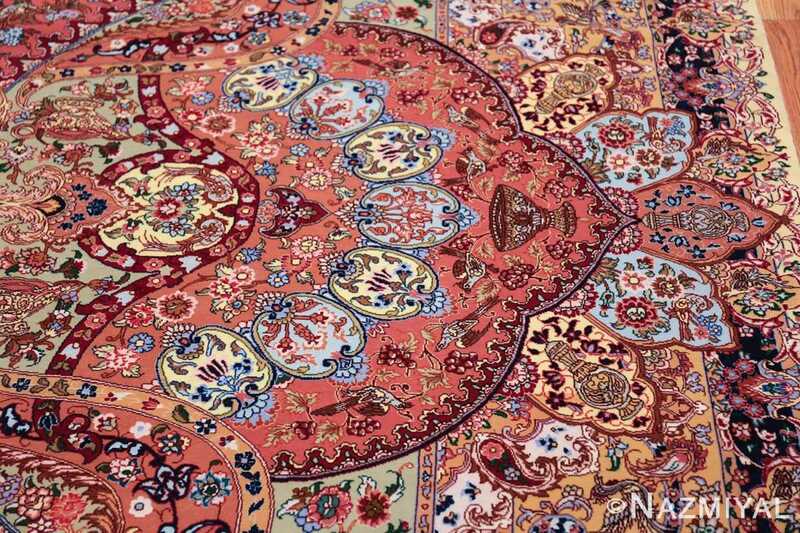 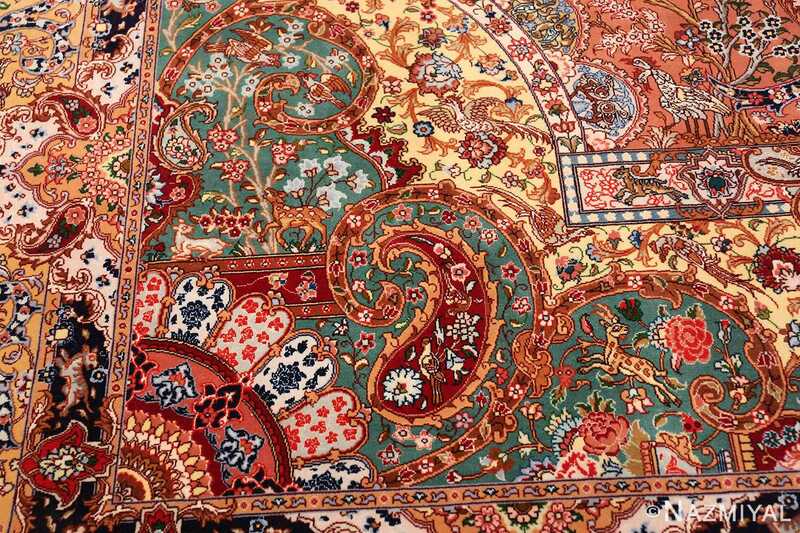 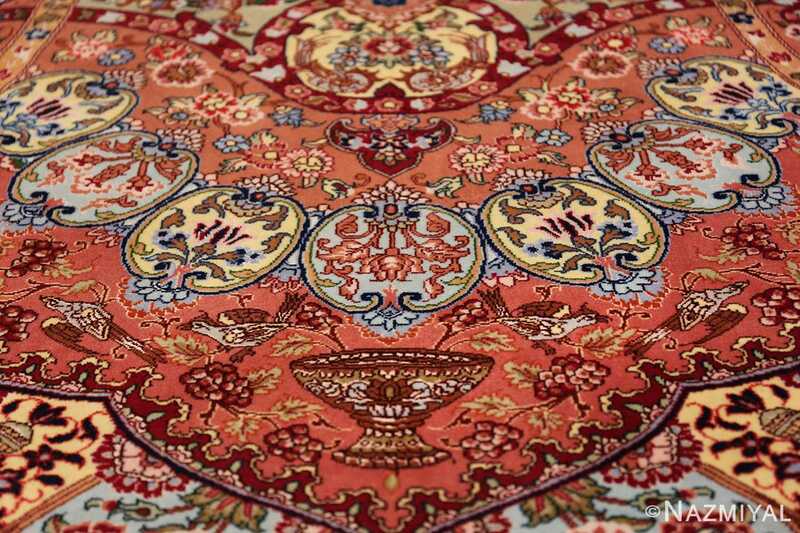 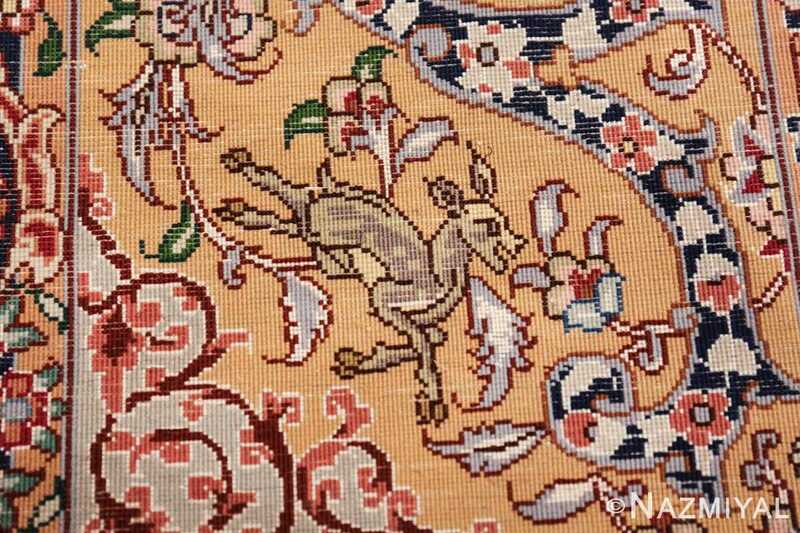 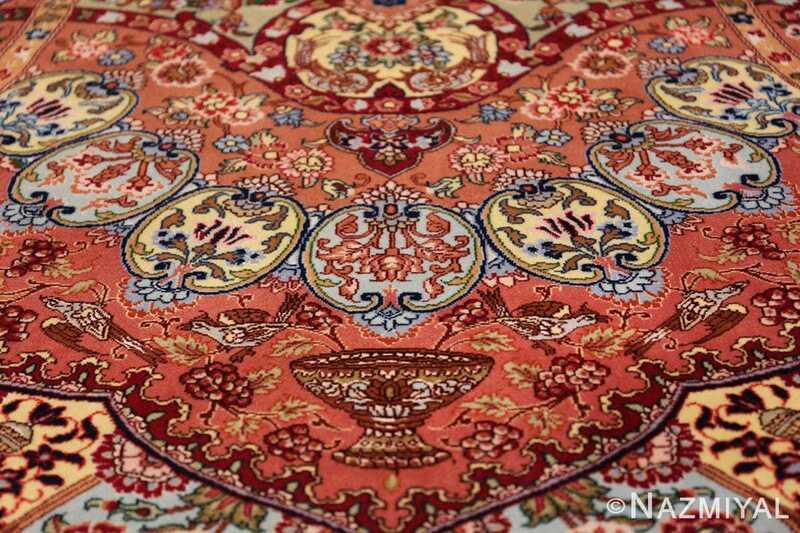 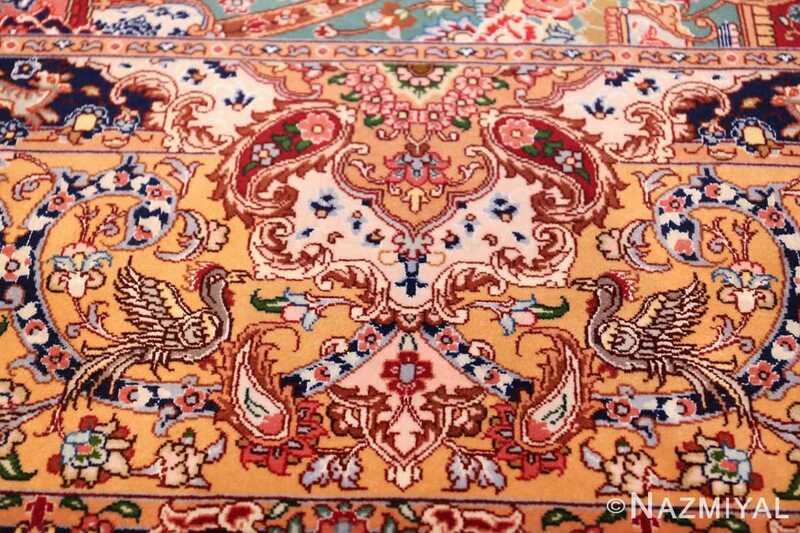 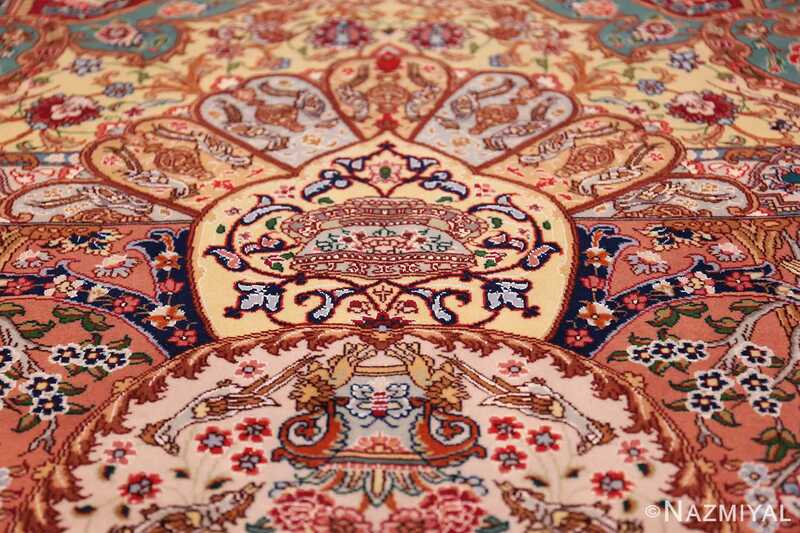 The very center of the central medallion of this vintage rug is a small discoid figure with several layers. These intricately designed layers form concentric rings around the blue flora in the center of this magnificent Persian Tabriz rug. 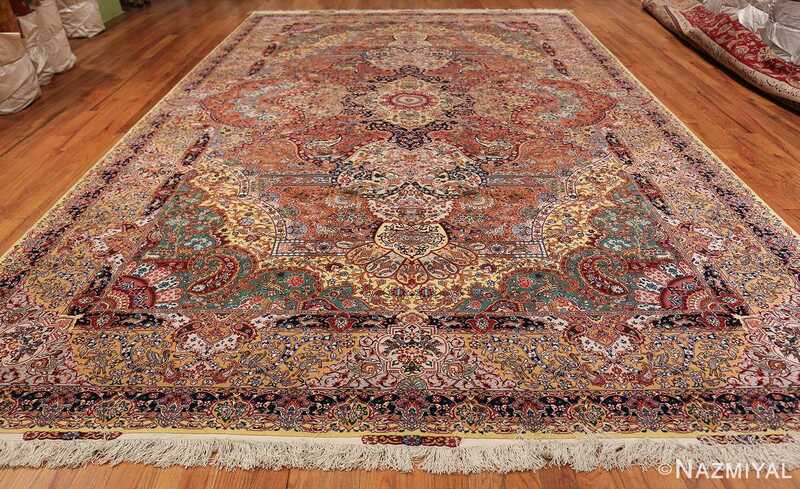 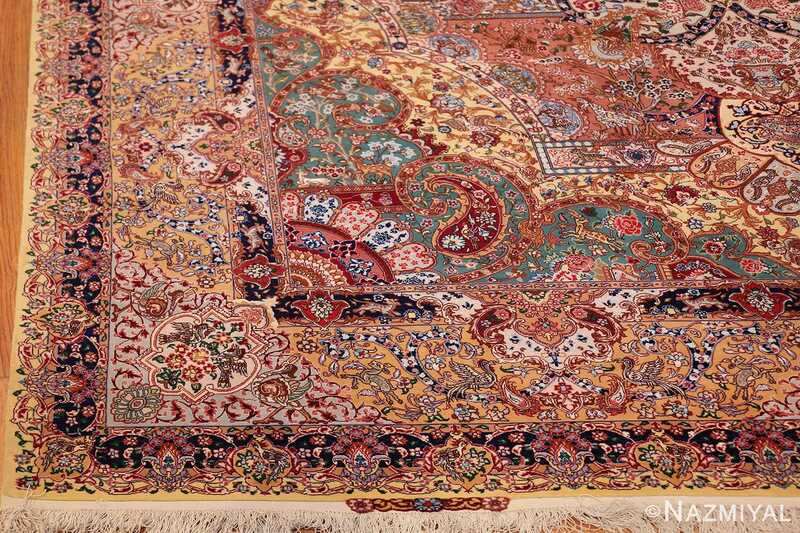 The elaborate design of the medallion of this intricate vintage silk and wool Persian Tabriz rug is surrounded by a fancifully decorated yellow gold background. 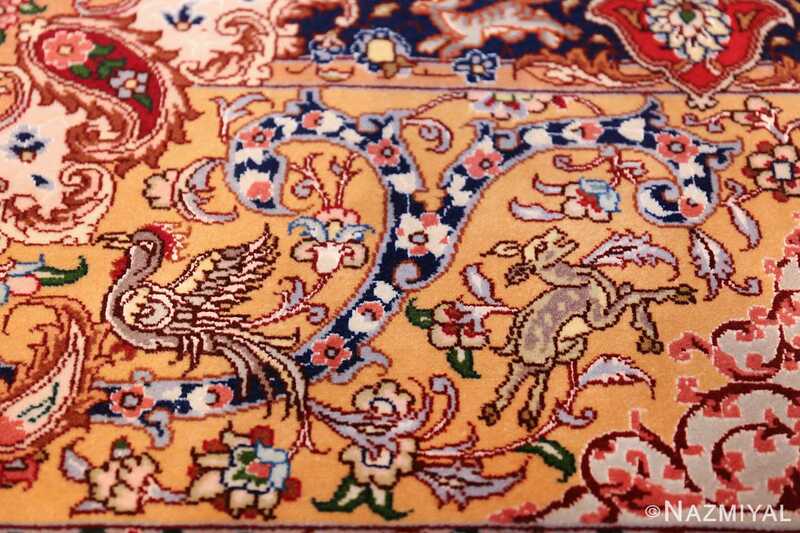 Its scalloped border is shaped into a diamond, and four paisley designed motifs embellish each edge. 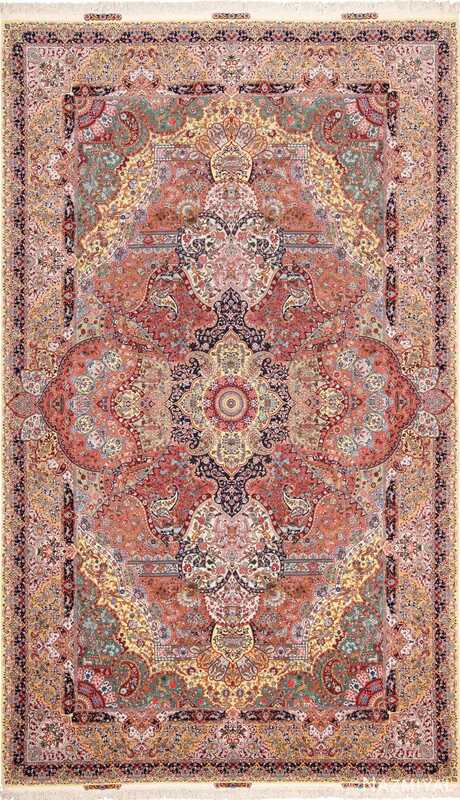 A lovely idyllic scene of blue and pink flower bouquets occupies the rest of the space. 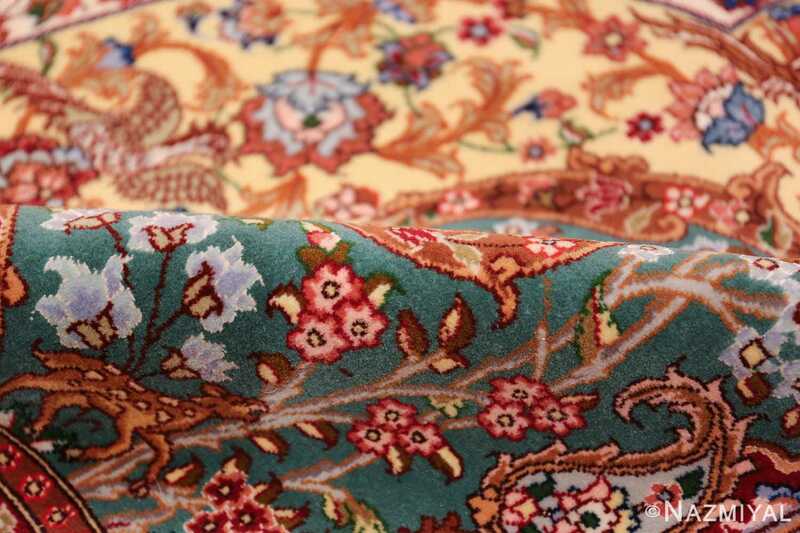 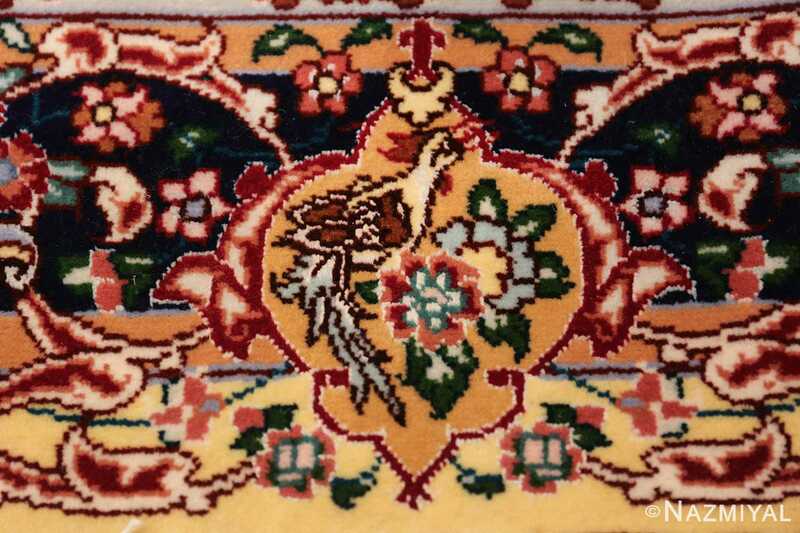 As the design progresses to the perimeter of the large size carpet, the diamond shape is replicated in gradually larger and more softly defined layers. 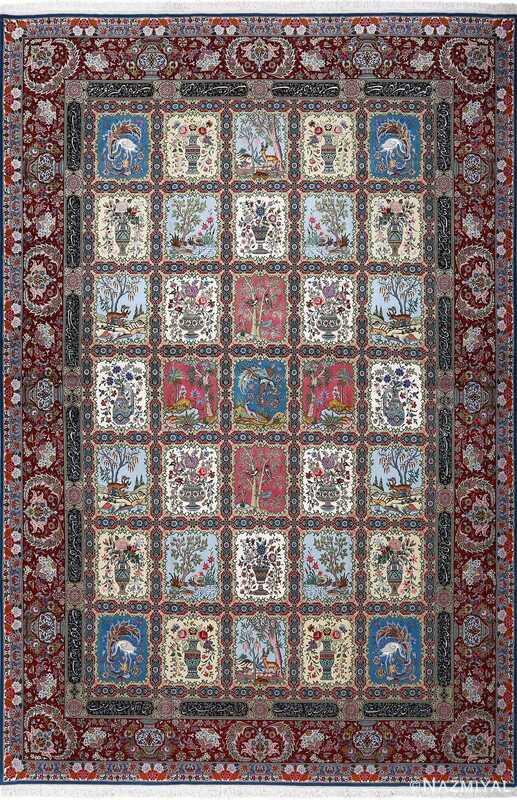 The stunning and intricately designed border creates a perfect frame for the central illustrations. 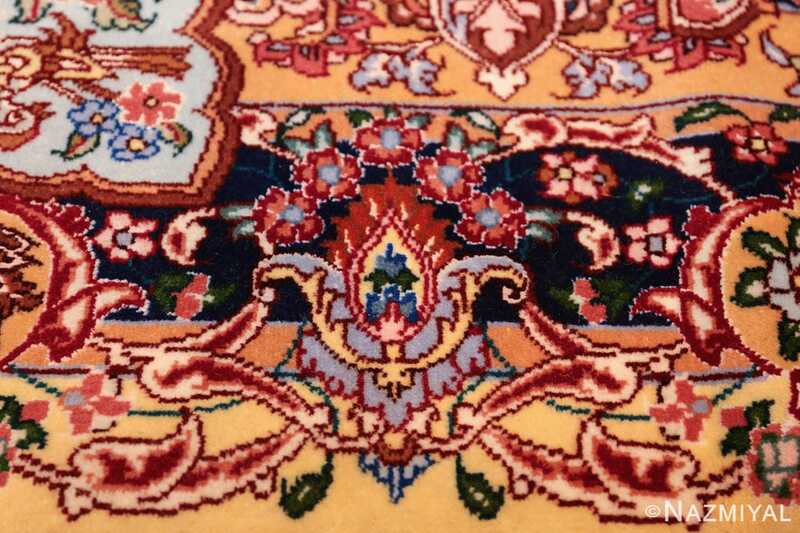 Navy blue is added to outline the various shapes, such as the central diamond and the border strands, for a final polishing touch. 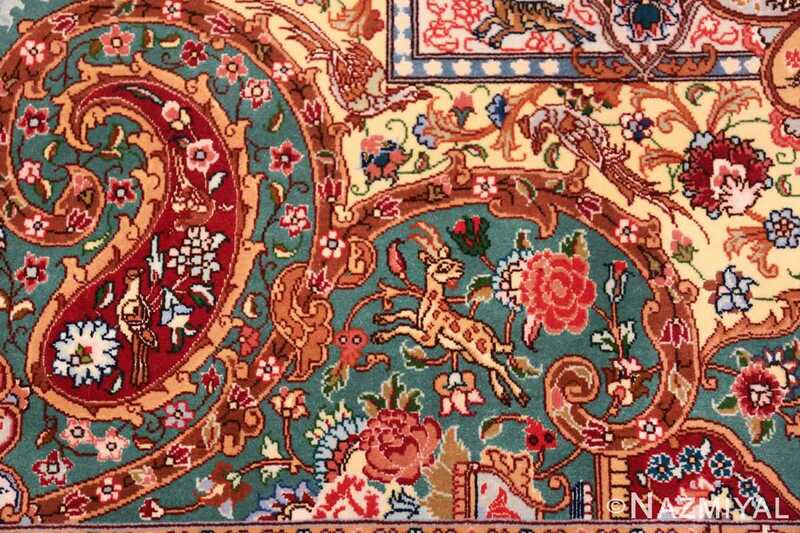 From a distance, the magnificent facade of this impressive vintage silk and wool Persian Tabriz rug has a blooming impression. 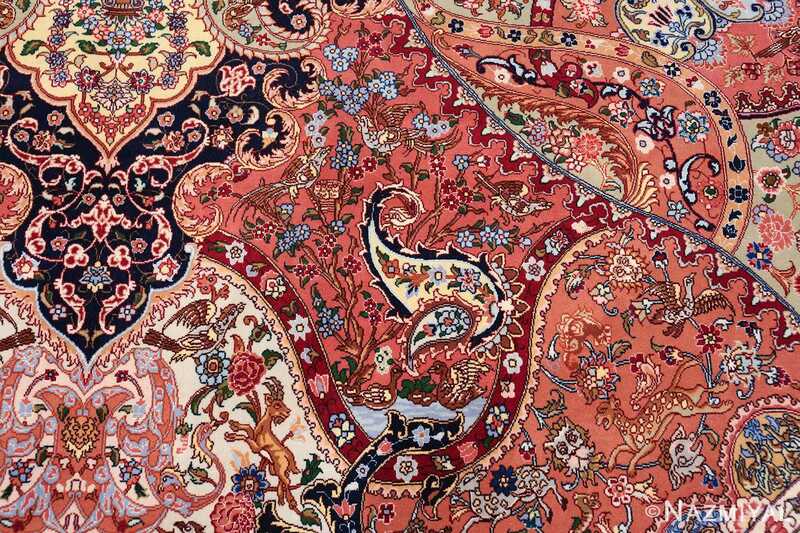 Its multiple surface layers seem to exist on completely different planes of space which is somewhat reminiscent of a Maurits Cornelius Escher art work. This magnificent masterpiece is sure to add an elegant and fascinating charm to any interior decor.